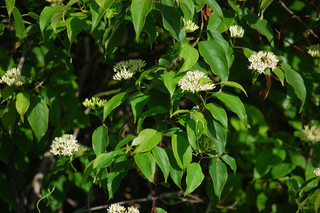 The Silky Dogwood, Cornus amomum, has attractive white, greenish-white or yellow flower clusters in the spring and blue and white fruit in the fall. This plant tolerates poorly drained soils. It is used for hedgerows, windbreaks and for stream bank erosion control. The fruits are bluish in color. The fruit is eaten by game birds, especially important as a source of food for migrating songbirds. The twigs are an important source of winter browse for deer and rabbits. Mature height: a small to medium sized shrub to 12'. Picture is for example only. We are shipping seedlings currently 6-12'' at the time of shipment.